The summer of 1914 was blistering hot in Ontario. Those with the time and the means could spend their days cooling off in and around the many lakes, especially in Muskoka, where private summer homes (“cottages”) and dozens of resort hotels were enjoying the heyday of the Age of Elegance. The assassination of an Austrian Archduke in June was overshadowed somewhat by an election in Ontario the following day. There seemed to be no foreshadowing of the impending cataclysm that would become the “Great War”. While the Toronto Star headline of Tuesday, July 28, 1914 read, “Austria Formally Declares War”, most Canadians thought that European nations were just sabre rattling, and weren’t unduly alarmed by the escalation of troop mobilizations and the daily ultimatums that began being issued. Canada’s Prime Minister, Sir Robert Borden, was holidaying at the Royal Muskoka Hotel, so surely these European antics had nothing to do with Canada. Borden was to have presented the trophies at the annual Muskoka Lakes Association Regatta that upcoming long weekend, but suddenly cut his vacation short and hurried back to Ottawa on the 30th. By Tuesday, August 4th Canada and the “world” were at war. With a mixture of excitement and patriotism, over 30,000 young Canadians hurried to enlist in a war that everyone thought would be over by Christmas. Four and half years later, 600,000 would have served, and 68,000 never returned. Of the 170,000 wounded, many were maimed, but surely all the survivors were forever changed by their experiences. So it’s hard to imagine that ordinary, leisurely days basking in a perfect summer could so suddenly precipitate into one of the most tumultuous times in modern history. My first two “Muskoka Novels” are set during this era, giving readers a chance to immerse themselves in the lives, loves, and adventures of the “lost generation”. Would you like to dine with Nancy Astor at her fabulous Thames-side estate, Cliveden, and spend a country house weekend at Lord Beaverbrook’s Cherkley Court, along with Rudyard Kipling? My characters do. They also rub shoulders with multimillionaire Alfred Vanderbilt aboard the doomed Lusitania, know Teddy Roosevelt and Winston Churchill, meet Britain’s (and Canada’s) top WW1 Ace, Billy Bishop, in an officer’s mess in France, and attend the moving funeral of poet-doctor John McCrae. Fictional Chas Thornton attends Magdalen College, Oxford, at the same time as the Prince of Wales, so it’s only natural that affable and debonair Chas knows “David”. Plucky, audacious Victoria Wyndham, who drives an ambulance during the war, encounters the Prince in France during his stint with the Grenadier Guards, just as a real ambulance driver with the FANY (First Aid Nursing Yeomanry) did. Having fictional characters interact with real people bestows a greater sense of reality to my historical novels. Of course it means that I do lots of extra research to ensure that I’m doing justice to the real people, and that any words I put into their mouths are plausible and in character. When Max Beaverbrook says to ambitious but fictional Jack Wyndham, “A cleaning lady at Whitehall once berated me for not being a gentleman, because true gentlemen never show their faces before 11:00 AM. It’s preposterous! You can’t run a country, and certainly not a business or a war, with that sort of lackadaisical attitude…” I was paraphrasing what Beaverbrook himself had said and thought, according to one of the several biographies I read about him. “I might be knocked down by a crazy cab driver on my way home,” Quentin pointed out. “Then I suggest you not stagger along the streets after a debauched night at the Cavendish,” Sid retorted. Chas suppressed a grin at his friend’s embarrassment. He had heard about the Cavendish Hotel where the ebullient, large-hearted Cockney proprietress, Rosa Lewis, a favourite of Edward VII, was famous not only for her cooking, but also for providing approved gentlemen with a ‘nice clean tart’. Rosa Lewis was immortalized in the TV series, "The Duchess of Duke Street". As a writer, I find it great fun to interact with real people, many of them pre-eminent in their day. A century ago it took the best part of a day to travel from Toronto to a cottage (summer home) in the Muskoka Lakes District of Ontario about 100 miles to the north. People boarded a train in the city with all their summer baggage, including chests of silver and china, pianos, and even cows, then transferred to one of the large lake steamers at the wharf in Gravenhurst, and were dropped off at their cottage or one of the many resorts on the three major lakes. Wealthy Americans often arrived at the pier aboard their private Pullman coaches with a bevy of servants in tow. This was the “Age of Elegance” in the Muskokas. Once at the cottage, you could signal the steamships to stop by to pick up passengers by raising a white flag. You can experience some of this today by taking a cruise on the R.M.S. (Royal Mail Ship) Segwun - the oldest operating steamship in North America. The much larger Wenonah II is an authentic replica of a steamship of that era, and the Wanda III is the restored private steam yacht, built in 1915, that once belonged to the mercantile Eaton family. 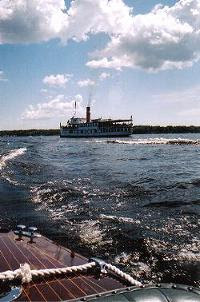 All are run by the Muskoka Steamship and Historical Society. On some excursions, they take you past “Millionaires' Row” - millionaires from a century ago, that is. There were plenty on the lakes - a tradition that continues today, with Hollywood celebrities among them. We enjoyed a magical sunset dinner cruise aboard the Segwun last Friday. How easy it is to imagine yourself in a less hectic time, to completely relax and appreciate the beautiful scenery slip past. Not so romantic are the clouds of black smoke spewing from the coal-fired boilers, so I can imagine how it must have been when dozens of steamers plied the lakes. Apparently the maids at cottages would rush out to take the washing off the line whenever a steamship was spotted approaching, otherwise the soot would foul the laundry. Nonetheless, the steamships were beloved on the lakes, and ran until 1958. The Segwun - the last survivor of a once grand fleet - was restored and began excursions again in 1981. Cottagers now come down to their docks to wave as she sails by. Motorboats flit alongside, tooting their horns to elicit a throaty blast from the Segwun in response. It seems so fitting to have this graceful steamer once again glide among the islands and past century-old cottages where she once dropped off passengers. It also inspires me to work on Book 3 in my Muskoka Novels series, which takes place during the Roaring 20s, and is never far from my thoughts! The photo above shows the Segwun in the distance. There’s something seductive about vintage wooden boats. Perhaps it’s the rich lustre of lacquered mahogany, the gleaming brass fittings, the sumptuous leather upholstery, and the way the long, elegant displacement hulls glide effortlessly through the water. Admirers of these Rolls Royces of watercraft are in for a treat this weekend in Gravenhurst Ontario for the 29th annual Antique and Classic Boat Show. 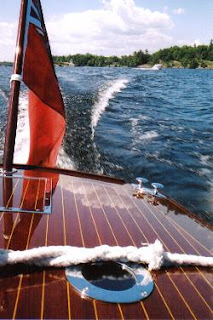 Well over a hundred of these lovingly maintained or restored boats will be lining the docks of Muskoka Warf on July 11. They range in size from small skiffs, like the Disappearing Propeller boats - or “Dippies” - to 70-foot steam launches. Hand-crafted, often unique, each has a story to tell. Many were built by the renowned Muskoka boat builders Ditchburn, Greavette, Minett, and Duke for the affluent who summered in Muskoka, like Sir John Eaton, whose family had built a mercantile empire by the turn of the last century. When I was doing research for my historical “Muskoka Novels”, I visited the Boat Show in 2005. Asking one of the owners about a beautiful 37’ Minett built in 1924, I was invited to go along for a spin. What a thrill that was! How quiet and smooth the ride. What better way to immerse oneself in research? Above is a photo that my daughter took over the stern of that boat, as she was also invited along. Another of her photos - of a Dippy - graces the cover of my first Muskoka Novel, The Summer Before The Storm. So this weekend I will once again be at the Antique and Classic Boat Show, but selling books this time. I plan to take a few minutes to wander the docks and admire the launches that so readily and delightfully conjure up a bygone era. Those who can’t visit the show this Saturday can still see antique boats at the only in-water exhibit in North America - the Muskoka Boat and Heritage Centre in Gravenhurst. The birthplace of poet-doctor Lieutenant Colonel John McCrae, who penned the famous poem, “In Flanders Fields”, is a small stone house in Guelph Ontario, which is now a museum dedicated to him. Visitors from all over the world come here in tribute to McCrae. On a World War 1 forum, I once corresponded with an Englishman who is determined to come to Canada to visit this tiny museum, which his wife had managed to do on a business trip to Toronto years ago. Yet I have talked to many people in Guelph who’ve never even been there. Perhaps today’s Canada Day celebrations will encourage more to come. There are games and family events, music, highland dancing, military displays and re-enactments, and birthday cake. And the poppies will be in full bloom. My Muskoka Novels mention John McCrae, and he makes a brief appearance in the second one, Elusive Dawn, in which his funeral is also described. I’ll be at the festivities again this year, selling books and enjoying the old-fashioned fun.